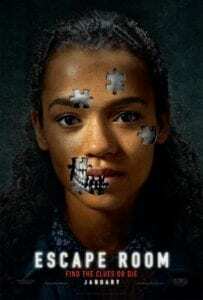 Starring Taylor Russell, Logan Miller, Deborah Ann Woll, Jay Ellis, Nik Dodani, Tyler Labine and Yorick van Wageningen. 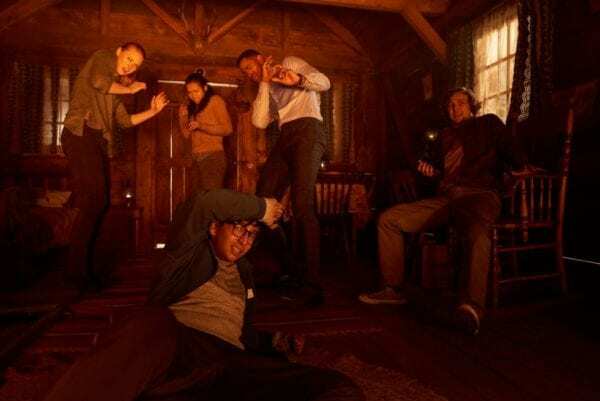 A group of unconnected people are invited to a uniquely immersive escape room experience, but soon realise that the stakes are legitimately life and death. I’ve never been to an escape room. The concept has always intrigued me, but spending a tonne of money for an hour of fun – or less than an hour if you’re actually good at the game – is somewhat beyond the means of the average freelance journalist. So the closest I’ve ever come to this world is spending my Sunday evening watching Adam Robitel’s new horror movie, which is somewhat unimaginatively titled Escape Room. It’s classic genre stuff from the start. Robitel introduces the audience to a range of characters, from nerdy physics student Zoey (Taylor Russell) to alpha male City douchebag Jason (Jay Ellis), who is described entirely fairly as having “an American Psycho vibe”. They all receive cryptic puzzle bozes inviting them to a high-end escape room experience. Fortunately for the entire ensemble, one of their number is escape room veteran Danny (Nik Dodani), who is able to walk them and the audience through the basic concept of these games. Dodani does a great job as an over-enthusiastic geek who finds his certainty and faith shattered when it quickly becomes clear that this is not a game, and their lives are all at stake. These rooms have been designed as killing machines, from a waiting area that turns into a high-intensity oven to an upside down pub with a vanishing floor. Each room is a compelling creation that is mined for maximum tension by Robitel, with this being a movie that will be capable of inducing serious sweaty-palmed stress in even the most jaded and experienced of horror fans. As well as the compelling tension of the ways in which the traps crank up the danger, there’s a surprising amount of intrigue to the characters themselves. The puppet masters behind the game use trauma from these people’s past to make the situation even more terrifying and Robitel does an impressively deft job of using brief flashback scenes to clue the audience in to how these situations are relevant. We get enough information to appreciate the gravity of the backstories, without ever becoming bogged down in the past. It helps that the performers are able to do a lot with the little that they’re given by the rather slim script. Russell, in particular, does a solid job of creating a character with whom the audience immediately gets on side, especially in her tender, quasi-familial relationship with fellow participant Amanda (Deborah Ann Woll). These two characters are certainly more interesting than generic slacker Ben (Logan Miller), whom we meet in the opening prologue – something of a spoiler for the third act, in a genre trope that seems to be increasingly common. He’s the sort of identikit horror character so thoroughly skewered by the brilliant Fran Kranz in The Cabin in the Woods. As the field of characters inevitably thins and the rooms get, paradoxically, less inventive, Escape Room seems to run out of energy a little. Like so many movies that thrive on creating an air of mystery, the destination is not nearly as fun as the journey. In fact, it seems as if writers Bragi F. Schut and Maria Melnik were unable to decide on an ending for their script and just decided to throw everything at the wall. The coda goes on for what feels like forever and delivers a series of unsatisfying reversals, ending a very entertaining horror film on something of a bum note. But, as much as the ending muddies the waters, it never takes away from the genuinely thrilling material that comes before it. Robitel has delivered a legitimately tense horror tale that largely manages to make the most of its killer concept and benefits from set pieces that have clearly been thought out in the best possible way. In a movie reliant on puzzles and tricks, it’s crucial that it follows its own internal logic and, for 90 minutes, this does exactly that. Unfortunately, it forgets that wisdom at the end in order to throw a load of post-it notes into a blender and piece together a finale from the resultant mush. Ironically, it doesn’t know how to escape its own storytelling corner.